Mild-mannered radio executive Brad Whitaker struggles to be a good stepfather to his wife Sara's two children, Megan and Dylan, and is seemingly sterile after an accident to his testicles some years ago. The children begin to grow closer to Brad, with Dylan confiding in him that he is being picked on at school and Megan asking him to take her to a father/daughter dance at her school. One night, the kids' biological father, Sara's ex-husband Dusty Mayron, calls and discovers Sara's marriage with Brad. He suddenly announces he will be visiting the next day. Sara hesitates to let her ex-husband into their home, but Brad convinces her that it is important for the kids that their father and stepfather establish a respectful relationship. When Dusty arrives, Brad is immediately intimidated by his tough and muscular appearance and his charm with Megan and Dylan. Dusty repeatedly talks Brad into letting him stay, despite Sara warning about Dusty's true nature. Brad soon wises up when it becomes clear that Dusty intends to drive Brad out of his kids' lives and reconcile with Sara. After Dusty shows Brad up again and again - getting the kids a dog, finishing a treehouse that Brad wanted to build with Dylan, making Brad appear to be racist - Dusty tries to drive a wedge between Brad and Sara by taking them to a fertility doctor, hoping that Brad's inability to give Sara a baby will send her into Dusty's arms. Still, the two men appear to reach an understanding after working together to teach Dylan how to defend himself. Additionally, Brad and Sara are overjoyed to learn that Brad's sperm count has increased significantly (implied to be a result of Dusty "invading his territory"), giving them hope of having a child together. However, Brad is stunned when Dusty reveals that he still intends to drive Brad out of the family. Desperate, Brad spends tens of thousands of dollars on early Christmas gifts, including a pony and $18,000 basketball tickets. At the game, Dusty once again shows Brad up by revealing himself to be friends with the coach of Dylan's favorite team, and an enraged Brad begins drinking heavily. During half-time, Brad is chosen to try to shoot a basketball to win a prize. Drunk, Brad goes on a rant about Dusty before accidentally pelting a cheerleader and a disabled child in a wheelchair in the face with basketballs. Humiliated, Brad moves out of the house; however, when Dusty tries to comfort Sara, she rejects him, and forces him to step up as a dad to help his kids with their busy schedules. Four days later, Brad is living in his office at work, depressed. Dusty, meanwhile, is overwhelmed by the responsibilities of being a full-time father. When Dusty decides to call it quits and leave on the day of Megan's father-daughter dance, his friend Griff goes to Brad and convinces him to fight for his family. Brad catches Dusty at a bar and tries to get him to come back. Dusty admits that he cannot handle the hard parts about being a father, and admires Brad for putting up with all the things that he has to go through. Brad says that all of the terrible parts about being a dad are worth it, because in the end he is doing it for his kids. This convinces Dusty to go to the dance, and he and Brad arrive together. There, they discover that the classmate who was picking on Dylan at school is a girl, and almost get into a fight with her father when Dylan physically retaliates. However, Dusty finally decides to follow Brad's lead on being a father, and instead quells the fight by starting a dance-off. Brad and Sara reconcile, and Dusty decides to stay and be a good "co-dad" to his kids. Later, the whole family is happy; Brad and Sara have a new baby boy named after Griff, and Megan and Dylan have finally accepted Brad as their stepfather. Dusty, who now has a job as a Panda DJ and becomes wealthy through his work, has moved in across the street after building a castle there, and he and Brad are now friends. Dusty eventually remarries, to a woman named Karen who has a daughter Adrianna, thus Dusty becomes a stepfather himself. Sara is immediately intimidated by Karen after meeting her; she feels that Karen's looks surpass hers and she is jealous of the latter's professions as a doctor and a novelist. In an ironic twist of fate, Dusty is now in exactly the same position that he put Brad in a year ago – visibly intimidated by his stepdaughter's more attractive father, Roger (John Cena). Paul Scheer as DJ "The Whip"
On November 5, 2014, it was confirmed that Will Ferrell and Mark Wahlberg would play the lead roles in the film. On November 12, Linda Cardellini joined the cast of the film, to play Ferrell's character's wife. On November 18, Hannibal Buress joined the film to play a sarcastic handyman. On January 28, 2015, Paul Scheer was added to the cast of the film, playing The Whip, a crazy DJ. Principal photography began on November 17, 2014, in New Orleans, Louisiana. On November 24 and 25, filming took place at Edward Hynes Charter School. On January 12, 2015, actors were spotted filming in the Lakeview area. On January 21, 2015, a scene was shot during a New Orleans Pelicans and Los Angeles Lakers game where Ferrell smashed a cheerleader (played by stuntwoman/wrestler Taryn Terrell) in the face with a basketball. Filming was scheduled to wrap on February 3, 2015, but lasted through February 6. The film premiered in the UK on December 9, 2015 and was theatrically released in the UK on Boxing Day, December 26, 2015 by Paramount Pictures. 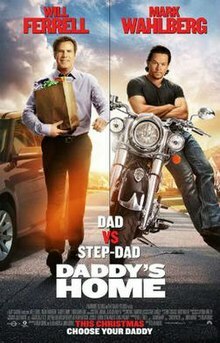 Daddy's Home was released digitally on March 8, 2016, before being released on Blu-ray and DVD on March 22, 2016. Daddy's Home grossed $150.4 million in North America and $92.4 million in other territories for a worldwide total of $242.8 million, against a budget of $69 million. It is Ferrell's highest-grossing live-action film, surpassing Elf ($220.4 million). In the United States and Canada, the film opened on December 25, 2015 alongside Point Break, Joy, Concussion, and the wide release of The Big Short. In its opening weekend the film was projected to gross $20–25 million from 3,271 theaters. However, after grossing $1.2 million from its early Thursday showings and $15.7m on its opening day, weekend projections were increased to $43–46 million. The film ended up grossing $38.7 million in its opening weekend, finishing second at the box office behind Star Wars: The Force Awakens ($149.2 million). It was the second biggest non-animated opening of Ferrell's career, behind Talladega Nights: The Ballad of Ricky Bobby ($47 million). On review aggregation website Rotten Tomatoes, the film has an approval rating of 31% based on 119 reviews and an average rating of 4.9/10. The site's critical consensus reads, "Will Ferrell and Mark Wahlberg have proven comedic chemistry, but Daddy's Home suffers from a dearth of genuinely funny ideas – and lacks enough guts or imagination to explore the satirical possibilities of its premise." On Metacritic, the film has a score of 42 out of 100, based on 30 critics, indicating "mixed or average reviews". Audiences polled by CinemaScore gave the film an average grade of "B+" on an A+ to F scale. Will Ferrell was nominated for a Teen Choice Award in the category Choice Movie Actor in a Comedy. In April 2016, a sequel was announced with Will Ferrell and Mark Wahlberg reprising their characters. Anders and John Morris wrote the script and Anders directed. In January 2017, Paramount Pictures courted Mel Gibson and John Lithgow to star in the sequel. The two were later confirmed to star in the film. Linda Cardellini, Owen Vaccaro and Scarlett Estevez also reprise their roles. John Cena will also return to the film, reprising his role from the first film. It was released on November 10, 2017. In an interview, Mark Wahlberg mentioned that they would like to get Liam Neeson for the third installment of the film. ^ "DADDY'S HOME (12A)". British Board of Film Classification. September 28, 2015. Retrieved September 29, 2015. ^ a b "Daddy's Home (2015)". Box Office Mojo. Retrieved April 12, 2016. ^ Denise Petski. "[WATCH] 'Daddy's Home' Trailer: Will Ferrell & Mark Wahlberg Star - Deadline". Deadline Hollywood. ^ Fleming Jr, Mike (November 5, 2014). "Will Ferrell, Mark Wahlberg Reteam On 'Daddy's Home'". Deadline Hollywood. Retrieved November 9, 2014. ^ Fleming Jr, Mike (June 4, 2014). "Paramount Looking To Re-Team Mark Wahlberg And Will Ferrell In 'Daddy's Home'". Deadline Hollywood. Retrieved November 9, 2014. ^ Ford, Rebecca; Kit, Borys (November 12, 2014). "Linda Cardellini Joins Will Ferrell, Mark Wahlberg in 'Daddy's Home'". The Hollywood Reporter. Retrieved November 18, 2014. ^ Kit, Borys (November 18, 2014). "Hannibal Buress Joins Will Ferrell, Mark Wahlberg in 'Daddy's Home'". The Hollywood Reporter. Retrieved November 19, 2014. ^ "Paul Scheer Heads To 'Daddy's Home', Joins Brian Huskey In Musical 'One Shot'". Deadline Hollywood. January 28, 2015. Retrieved January 29, 2015. ^ Scott, Mike (October 16, 2014). "Will Ferrell, Mark Wahlberg to reteam in New Orleans for 'Daddy's Home'". nola.com. Retrieved October 20, 2014. ^ "Will Ferrell and Mark Wahlberg are headed to New Orleans for 'Daddy's Home'". onlocationvacations.com. October 17, 2014. Retrieved October 20, 2014. ^ "'Daddy's Home', starring Will Ferrell and Mark Wahlberg, spotted filming at a New Orleans Elementary School this week". onlocationvacations.com. November 24, 2014. Retrieved November 26, 2014. ^ "'Daddy's Home', starring Will Ferrell and Mark Wahlberg, filming in Lakeview, New Orleans". onlocationvacations.com. January 12, 2015. Retrieved January 15, 2015. ^ "'Taryn Terrell gets smashed in the face by Will Ferrell'". gerweck.net LLC. January 22, 2015. Retrieved January 23, 2015. ^ B. Gill, Stanley (October 10, 2014). "Louisiana Film TV Production Jobs Hotline – October 10, 2014". thehollywoodsouthblog.com. Retrieved October 20, 2014. ^ "On the Set for 2/9/15: Will Ferrell Wraps 'Daddy's Home', Kate Beckinsale Starts Shooting 'Love & Friendship' & More". ssninsider.com. February 9, 2015. Archived from the original on 2015-09-30. Retrieved February 10, 2015. ^ "Ikon London Magazine coverage of Daddy's Home Premiere". Ikon London Magazine. 10 December 2015. Retrieved 3 March 2018. ^ Cunningham, Todd (June 3, 2015). "Mark Wahlberg-Will Ferrell Comedy 'Daddy's Home' Gets Holiday Release". thewrap.com. Retrieved June 4, 2015. ^ "Daddy's Home (2015)". DVDsreleasedates. ^ a b "Will Ferrell". boxofficemojo.com. ^ Anthony D'Alessandro (December 21, 2015). "'Force Awakens' Will Own Christmas Weekend As Five Wide Releases Join The Fray – Box Office Preview". Deadline Hollywood. Retrieved December 23, 2015. ^ "Will Ferrell, Mark Wahlberg Comedy 'Daddy's Home' Earns $1.2M In Thursday Previews". Deadline Hollywood. ^ "Daddy's Home (2015)". Rotten Tomatoes. Retrieved May 25, 2016. ^ "Daddy's Home (2015)". Metacritic. Retrieved December 30, 2015. ^ Vulpo, Mike (May 24, 2016). "Teen Choice Awards 2016 Nominations Announced: See the "First Wave" of Potential Winners". E!. Retrieved May 25, 2016. ^ Fleming Jr., Mike (April 22, 2016). "Will Ferrell & Mark Wahlberg Set 'Daddy's Home' Sequel At Paramount". Deadline Hollywood. Retrieved January 30, 2017. ^ Fleming Jr., Mike (January 30, 2017). "Mel Gibson, John Lithgow Circling 'Daddy's Home' Sequel". Deadline Hollywood. Retrieved January 30, 2017. ^ Kroll, Justin (February 15, 2017). "Mel Gibson and John Lithgow Join 'Daddy's Home' Sequel". Variety. Retrieved February 16, 2017. ^ Fleming Jr, Mike (March 10, 2017). "Jon Cena Back For 'Daddy's Home 2'". Deadline Hollywood. Retrieved March 10, 2017. ^ Lee, Ashley (February 1, 2017). "Paramount Sets 'Daddy's Home 2' for November Release". The Hollywood Reporter. Retrieved February 2, 2017. ^ "Mark Wahlberg wants Liam Neeson for Daddy's Home 3". ^ "Will Ferrell And Mark Wahlberg Had A Real Daddy's Home 2 Moment When Their Kids Started Talking".